REGIONAL SOURCING: Farm to Freezer is Back! UPCOMING EVENTS: Sustainable Agriculture, NFCA Annual Meeting, Supporting Start-Ups & More! Across our region, our co-ops are working together to support their shared success and build a more healthy, just, and sustainable food system. On October 24, over 100 people attended the Neighboring Food Co-op Association’s (NFCA) Fifth Fall Gathering, bringing together member co-ops and partner organizations for a day of networking, shared learning, and collaboration. The meeting included representatives from more than 40 food co-ops, start-ups, and partner organizations. David Thompson, author and president of the Twin Pines Co-operative Foundation, discussed “The Role Co-ops & the Civil Rights Movement” in his keynote address, sharing his research and perspective on the historical collaboration of these two movements. Attendees were then invited to reflect on how our co-ops contribute to movements for a more just and sustainable future in our own time. Special guests included Pat Sterner, COO of the National Cooperative Business Association, and Roger Noonan, President of the New England Farmers Union (NEFU), who updated attendees on key policy issues in the co-operative community and food system. Activities during the day included opportunities for collaboration on everything from planning a successful expansion and healthy food access to planning successful capital campaigns. Afternoon workshops addressed how co-ops can use Co-operative Community Funds to engage their communities, helping start-ups communicate the co-op difference to local development organizations, and sharing effective strategies for thriving in an increasingly competitive marketplace. Executive Director Erbin Crowell announced the NFCA’s collaboration with regional distributor Associated Buyers to offer more affordable natural products to member co-ops, and the re-launch of the NFCA’s Farm to Freezer program, a line of Northeast grown frozen fruits and vegetables available exclusively through member co-ops. NFCA Membership and Outreach Coordinator Bonnie Hudspeth reminded attendees to save the dates for CCMA, the national conference for food co-ops, which will be hosted by the NFCA in Amherst, MA, June 9-11, 2016. The Neighboring Food Co-op Association includes more than 35 food co-ops and start-ups, locally owned by over 90,000 people across New England. For more information, please visit www.nfca.coop. WASHINGTON POST: “One Big Reason REI Can Decide to Skip Black Friday…” It’s a Co-op! “It was savvy marketing, a generous employee benefit and an external display of the brand’s principles all rolled into one. It’s also an example of something REI can do because it’s one of the country’s few large retail cooperatives and not a publicly traded company. A cooperative, roughly defined, is a business that’s owned not by shareholders but by members—people who use the business, such as its shoppers, producers or employees. In cooperatives, profits are treated as a surplus and are redistributed to members or reinvested in the business. And because the governing principle is to run the business in the best interests of their members, rather than shareholders, cooperatives tend to think in longer time horizons than the quarter-to-quarter whims of Wall Street. Northeast Grown Frozen Fruits & Vegetables Are Back — Only at Your Neighboring Food Co-op. Your local food co-op works hard to support local producers. And by working together, the members of the Neighboring Food Co-op Association (NFCA), a network of over 35 food co-ops and start-ups across New England, are increasing our impact as we grow the regional food system. Recognizing that most frozen fruits and vegetables on our shelves come from far away, the NFCA launched ‘Farm to Freezer,’ an innovative pilot project a few years ago to explore the feasibility of sourcing, processing, and packaging these products closer to home. The goal was to extend the marketing season for family farmers in the Northeast and increase the availability of healthy, sustainably grown, regionally sourced fruits and vegetables for our members and shoppers. The project was a great success, moving more than 13,000 pounds of locally grown Blueberries, Organic Green Beans, Organic and Non-GMO Sweet Corn, and Organic Broccoli, and demonstrating what food co-ops can accomplish when we use our shared strength to create change in our food system. Now the NFCA is bringing Farm to Freezer back in collaboration with regional distributor Associated Buyers to increase availability to member food co-ops across New England. A new addition to the product line is Organic Edamame. The NFCA’s Northeast Grown Frozen Fruits & Vegetables are easy to find in your food co-op’s freezer section — they’re packed with a simple black and white label in a clear package so you can see what’s inside. 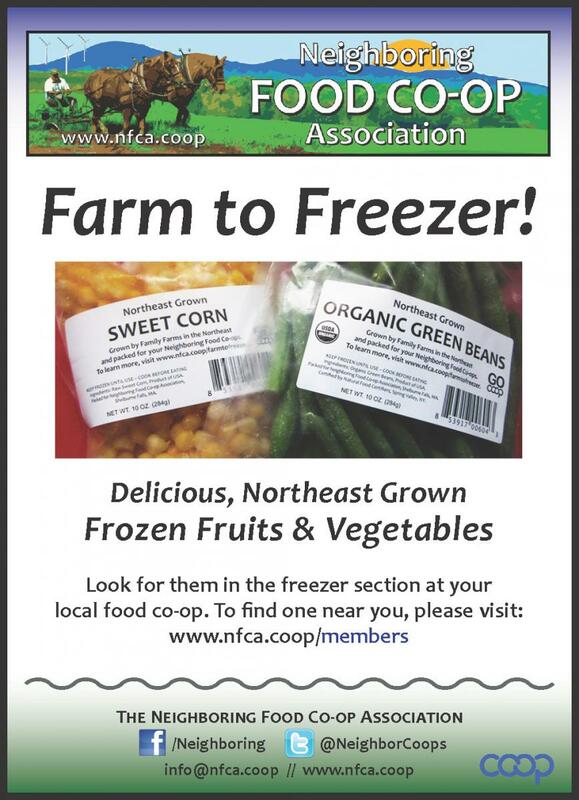 For more information, please visit www.nfca.coop/farmtofreezer or stop in at your local food co-op: www.nfca.coop/members. 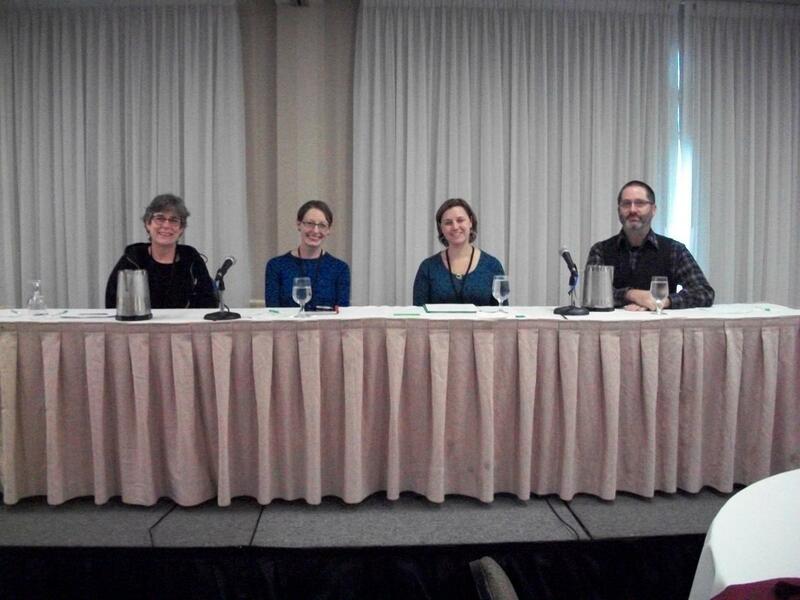 Crowell was part of a panel on ‘Accessing Local and Regional Food Systems’ at the New England Farmers Union (NEFU) Annual Convention, November 6-8 in Concord, NH. The NFCA is an affiliate member of the Farmers Union, representing a shared commitment to strengthening family farming and fisheries in our region. Over the past few years, the organizations have partnered on several projects, including co-operative education, regional product development, and increasing Healthy Food Access for consumers on limited incomes. Farm-to-School grants and technical assistance for food service professionals. The Farmers Union works to promote programs such as these, giving voice to family farmers and fishermen, working to influence food system policy, and offering opportunities for education and advocacy. Other topics at the Convention included ‘Climate Change and Agriculture,’ the Food Safety Modernization Act, and a listening session with Congresswoman Ann McLane Kuster, U.S. Representative for New Hampshire’s 2nd Congressional District. Whatever your role is in the food system, you can become an individual member of the New England Farmers Union and help strengthen the voice of our region’s family farmers and fishermen. And if you are already a member of an NFCA-member food co-op, you can receive a discount membership for $25! Please visit www.newenglandfarmersunion.org to join online.